This is still happening. It really shouldn't be. Vogue Netherlands featured blackface in an editorial from their May 2013 issue. The debacle marks the latest in an unfortunately long line of fashion folks appropriating blackface for "edgy" shoots, flagrant publicity stunts and, perhaps worst of all, simply because actual black models remain scarce enough that finding one is a hassle. Here, a roundup including many of the worst recent (and some repeat) offenders. 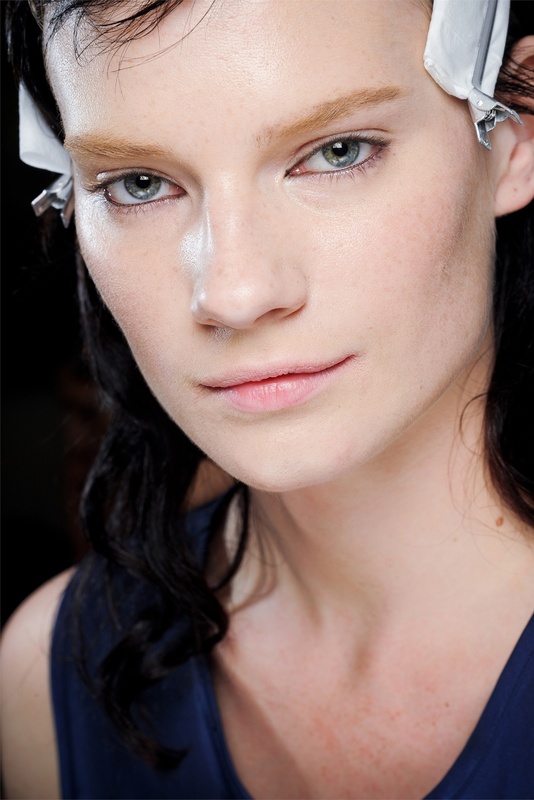 Model Querelle Jansen (here without blackface, for reference) wearing Louis Vuitton — and styled to represent Vuitton designer Marc Jacobs' inspiration for each outfit, Josephine Baker and Grace Jones respectively. American model Ondria Hardin for a Numéro editorial titled, yes, "African Queen." (Again, here's Ondria without the blackface.) After an understandable backlash, the French magazine offered a fauxpology to the Huffington Post: "Numéro has always supported the artistic freedom of the talented photographers who work with the magazine to illustrate its pages, and has not took part in the creation process of this editorial. For its part, Numéro magazine, which has the utmost respect for this photographer’s creative work, firmly excludes that the latest may have had, at any moment, the intention to hurt readers’ sensitivity, whatever their origin." Westwood's recent runway — usually some of the most diverse, in terms of their casting — shows have frequently featured models with faces painted in a wide range of colors. This "hearty" shade only showed up twice, though. Korean designer Lie Sang Bong also presented his fall 2012 collection in Paris last February — there, the blobby blackface appeared a little less harsh. But, you know, still blackface. Beyoncé posed with her face "voluntarily darkened" for an editorial celebrating Nigerian human rights activist Fela Kuti, explained L'Officiel Paris. Their statement also described the photos as "a return to her African roots." Constance Jablonski (here in her natural skintone) donned borderline blackface and an afro for this Numéro editorial. "Her" baby co-star is modeling without racially-insensitive bodypaint. The shoot's stylist, Patti Wilson, told Vogue Italia that she "wanted to kind of comment on what is going on now with [white celebrities] getting all of these black children." The afros came about, she explained, because rain on the day of shooting ruined Constance's hair, and disco wigs were the only things available. Really. Brazilian model Arthur Sales (who normally looks like this) donned blackface for this menswear editorial shot by Milan Vukmirovic. To make the "white-guy-painted-black" thing very clear to readers, one photo from the spread shows his hard, lily-white abs. V magazine offered no explanation for this photo of top Russian model Sasha Pivovarova (again, here sans the race-changing paint job) fighting with fellow model Heidi Mount. The thirteenth cycle of America's Next Top Model (the one for short girls) saw contestants styled to look "biracial." Tyra Banks later apologized about the controversy that ensued on her talk show: "It's my number one passion in my life to stretch the definition of beauty. I listen to many heartbreaking stories of women who thought they would be happier if they looked different. I want every girl to appreciate the skin she's in." Carine Roitfeld, French Vogue's editor at the time, applauded model Lara Stone for representing "a radical break [from] the wave of anorexic models." Of course, in the editorial she also represents a break from the wave of Caucasian models — but only because she's been painted so. Vogue Italia's "Black Issue" made fashion history by featuring only models of color. (It became the magazine's highest selling issue.) Still though, the beauty editorial, featuring model Chanel Iman, looked like the images above. 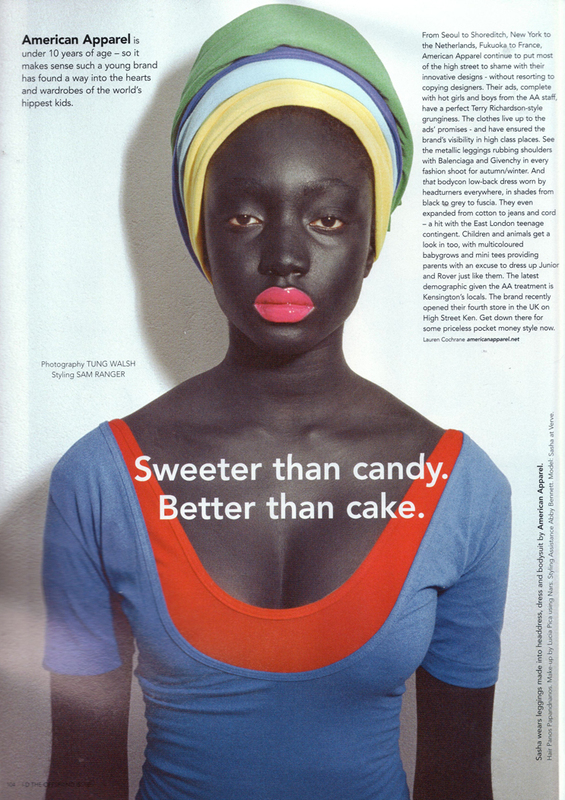 i-D magazine painted Jamaican model Sasha Gaye-Hunt in blackface (with bright red lips to boot) for a short feature on American Apparel in 2007. Just the sort of controversy-causing imagery the clothing brand trades on, then. Photographer Steven Klein — who also shot Lara Stone in the Vogue Paris photos above — lensed the following editorial for an issue of Italian Vogue that didn't include any actual models of color.